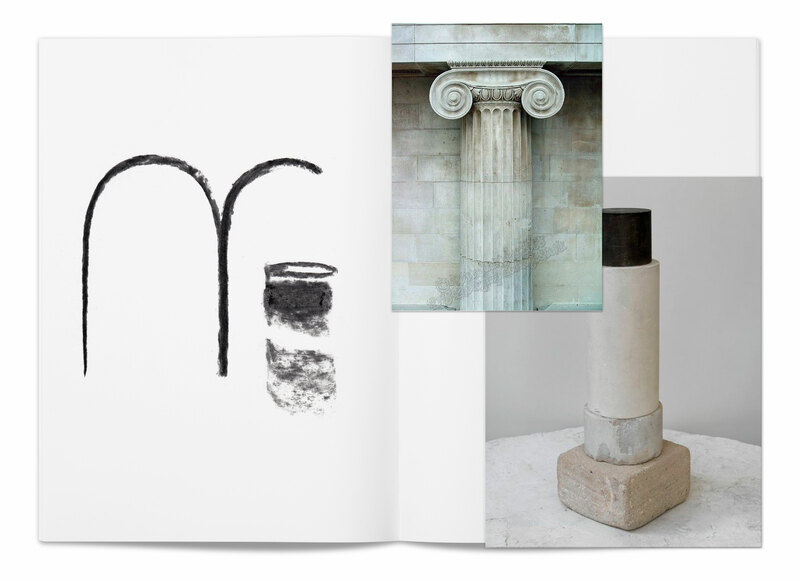 The pursuit of symmetry, the perfect shapes, the combined use of different materials and their processing are the distinctive aspects of a collection that recalls the aesthetics of classic Mediterranean architecture. 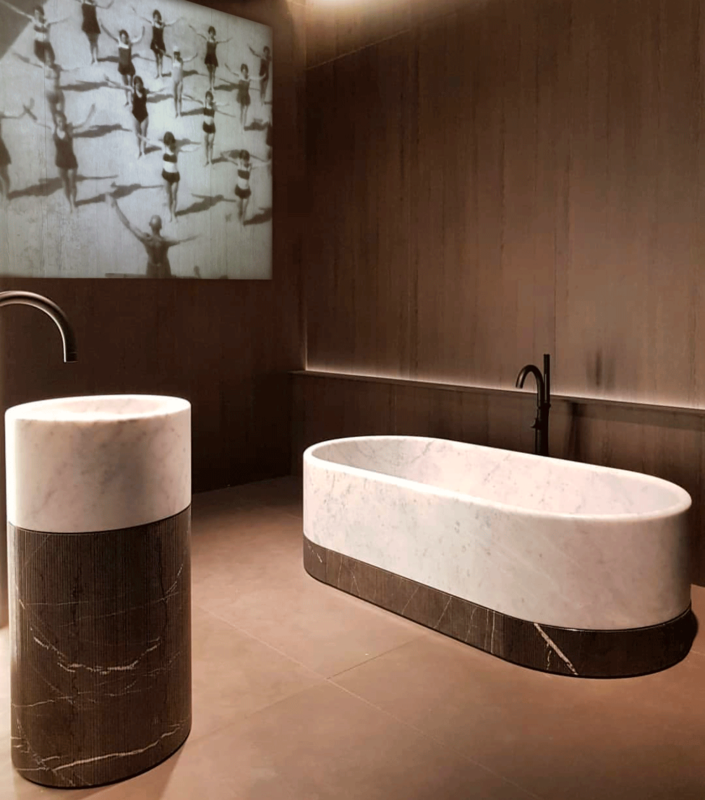 The washbasin and bathtub are monoliths made of stones varying in nature, colour and finish and are therefore the key elements of the bathroom, which is complemented with screens, fitted with mirrors and lights, and towel racks. 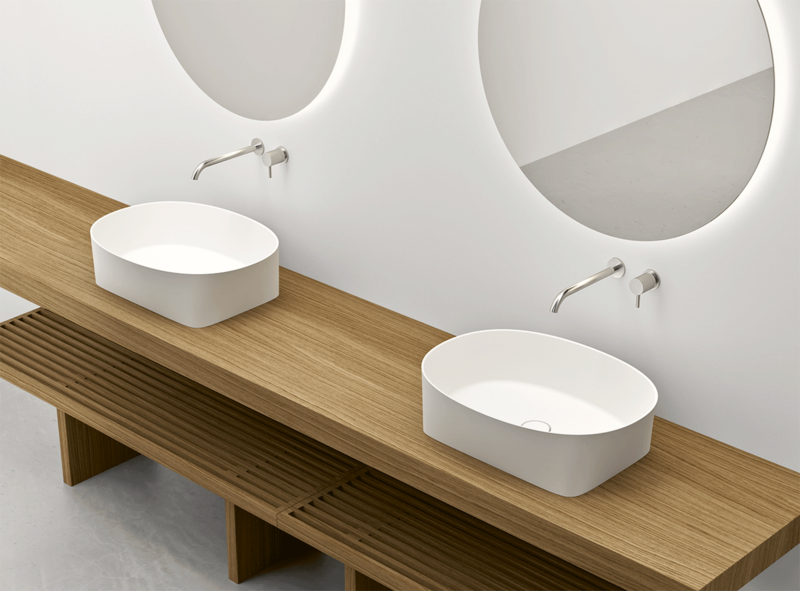 The Roma washbasins are also available with wooden parts alternated with ceramic and metal. 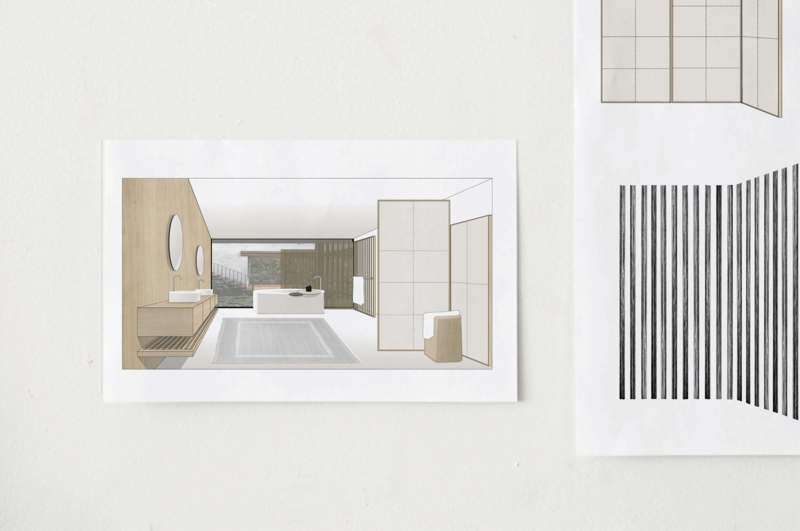 Large mirrors can also be paired with a smaller luminescent screen are evocative of the classic geometry in architecture. 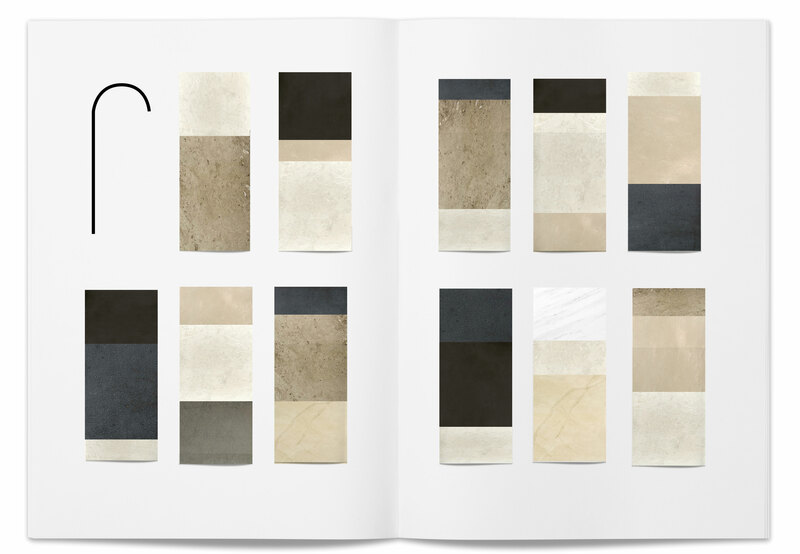 Material Moodboard combining different tactile qualities such as a matte sandstone texture, a slightly irregular vertical lined texture, and a rough texture reminiscent of old stone floors. 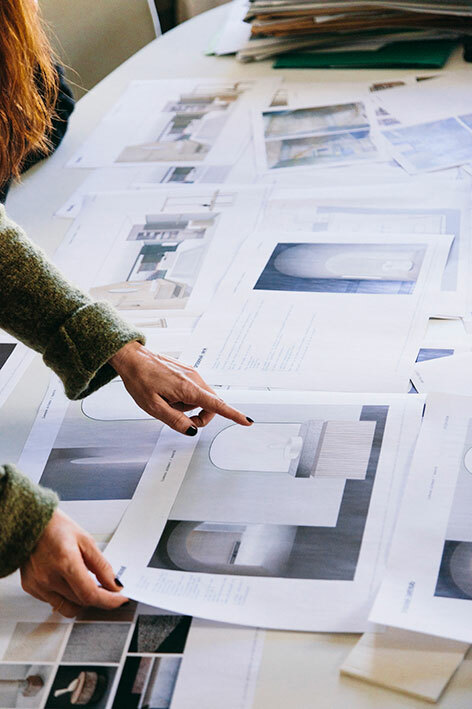 Large mirrors can also be paired with a smaller luminescent screen. 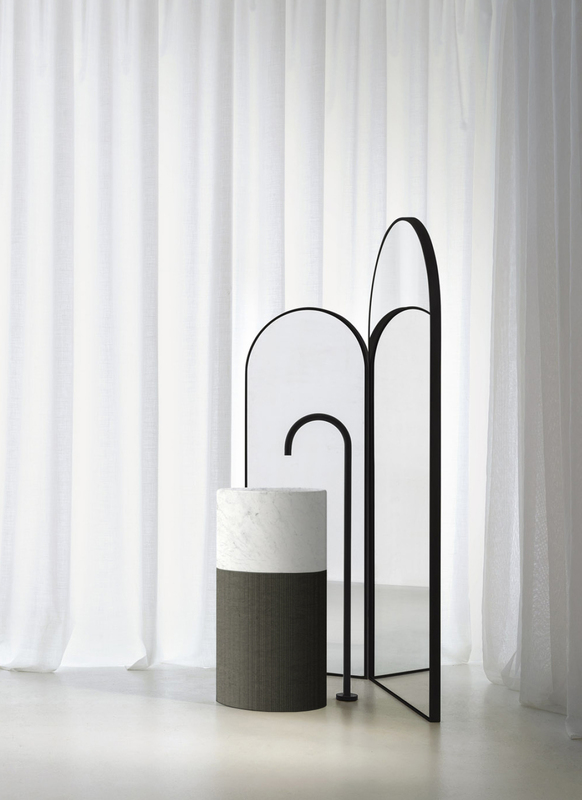 The collection is complemented by simple free standing metal towel rack. 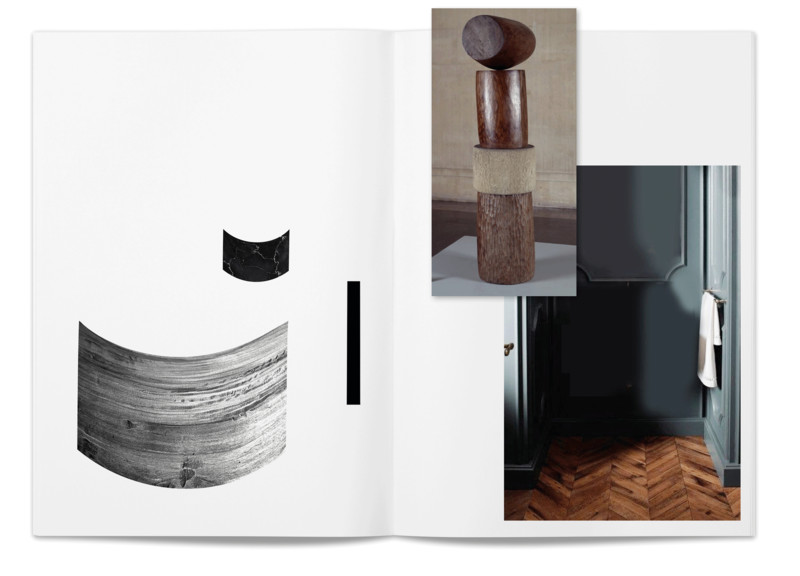 Up to 3 stones in 4 diverse shades and textures are stacked upon each other like fractions of a column, allowing for uniform to contrasted compositions. 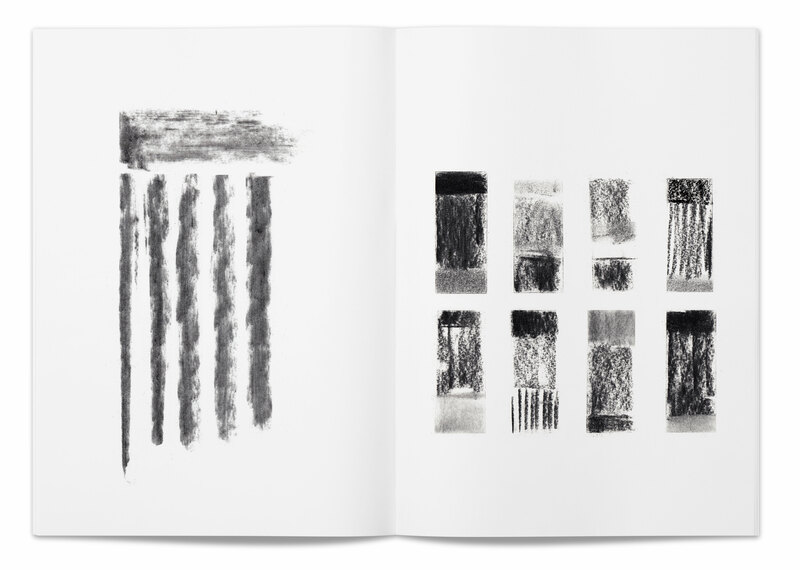 Sketchbook - exploration of textures and compositions. 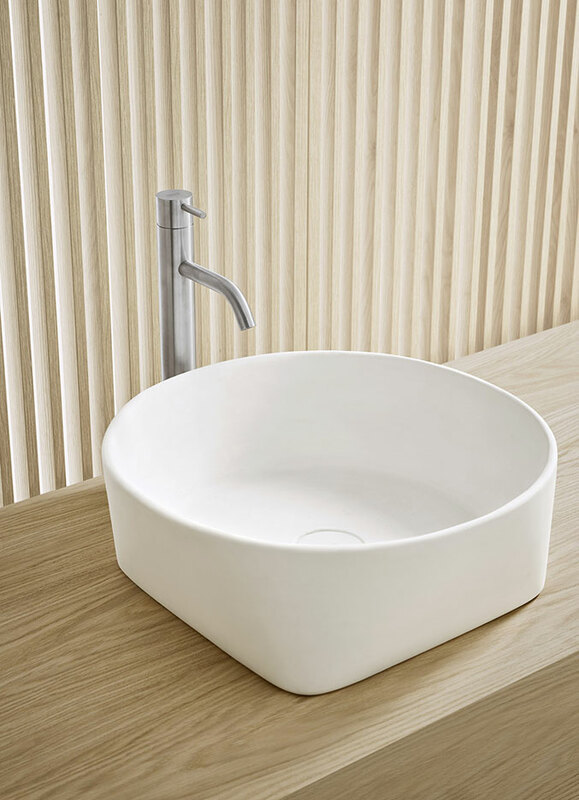 The Roma washbasins are also available with wooden parts alternated with ceramic and metal. 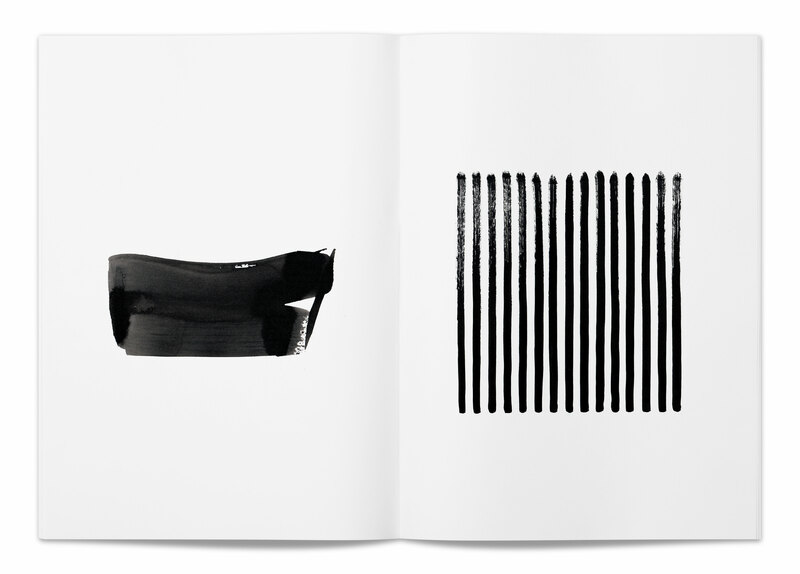 Combination of materials and finishes are the the distinctive aspects of this collection. 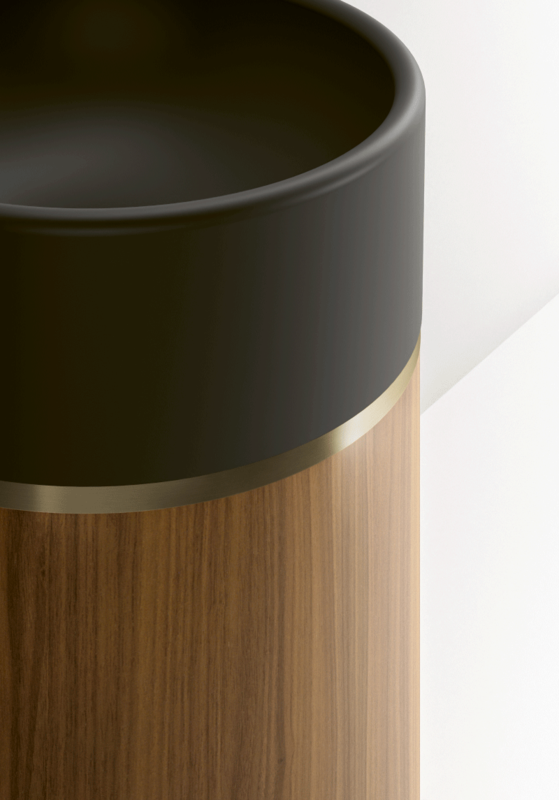 The new wood version includes a thin line of brass or polished steel to add a little shiny contrast. 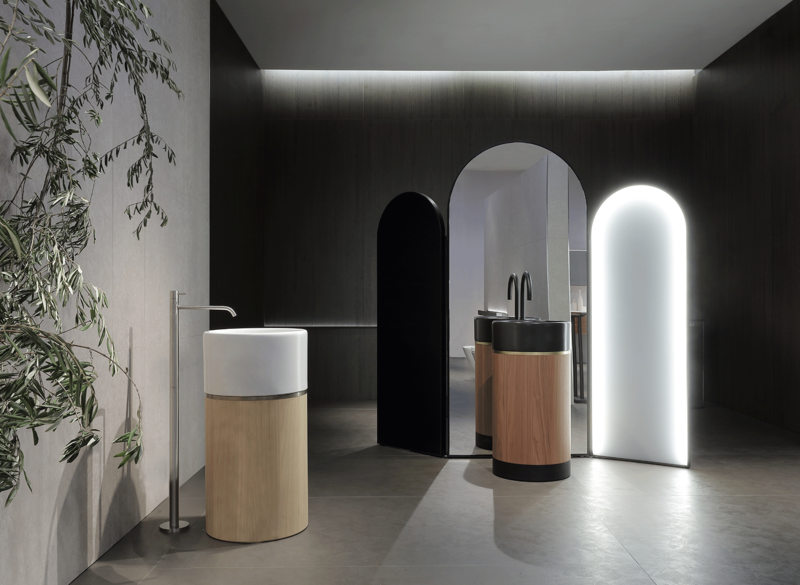 Noorth Stand at Salone del Mobile 2018. 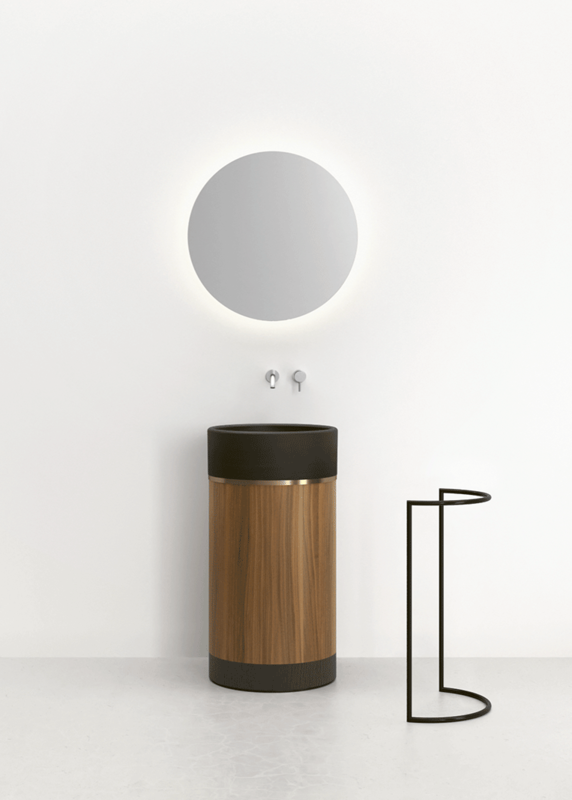 Ceramic washbasin combined with darker shades of wood for an elegant appeal. 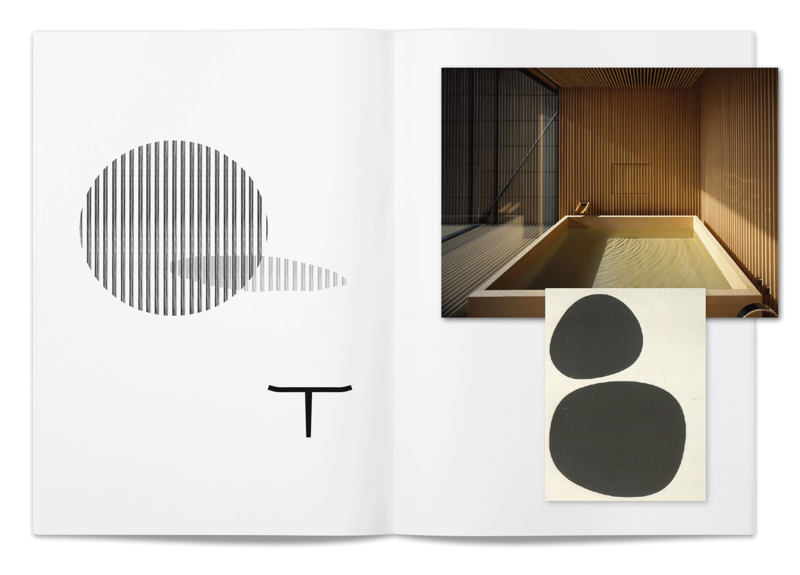 Azuma translates the warm sensibility of the Japanese bath into a contemporary language. 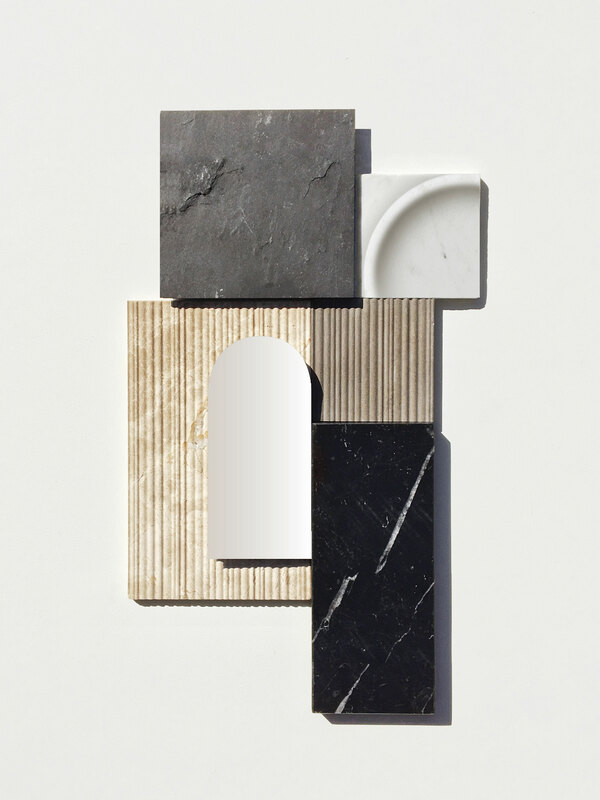 Artificial and natural elements are harmoniously combined. 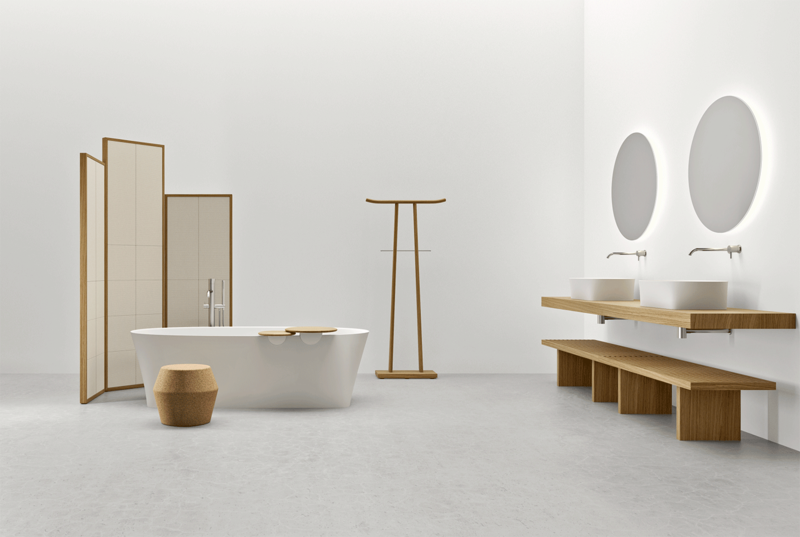 The abstract white feel of Milltek - used for the sink and bathtub -becomes warmer through a soft shape and its combination with wood and cork. 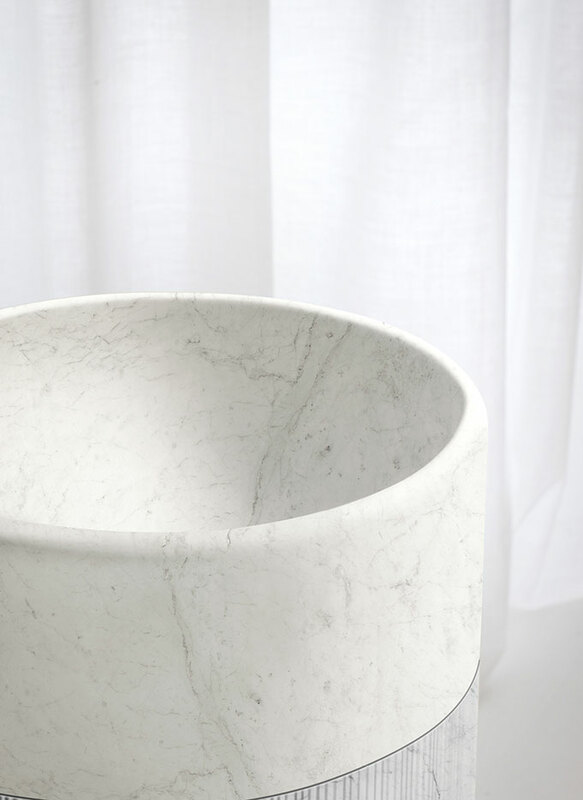 Like a drop of falling water, it evolves from a circular top that gradually transitions into a square shape at its base. 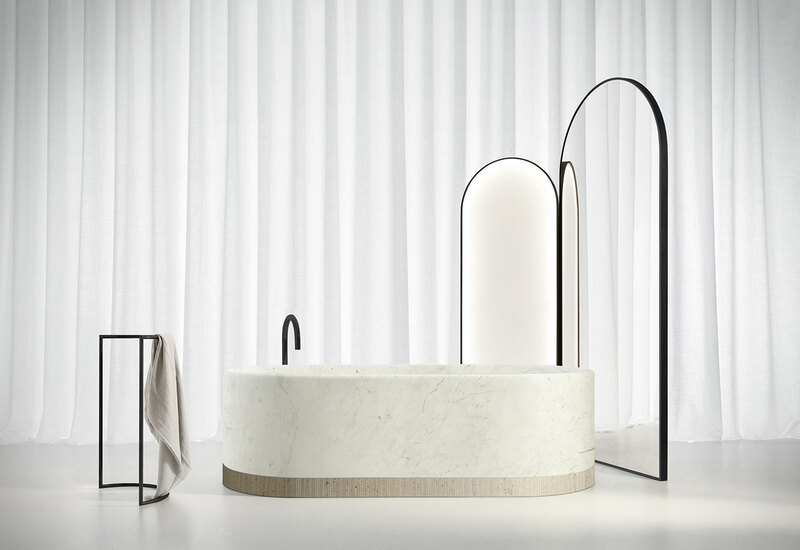 Wooden bathtub trays recall large pebbles smoothed by the flow of water; wooden screens with vertical strips with mirrors allow the light to be modulated with a continuous interplay of shadows, transparency or reflections, and are fitted with knobs and towel rails for hanging bathrobes and clothes. 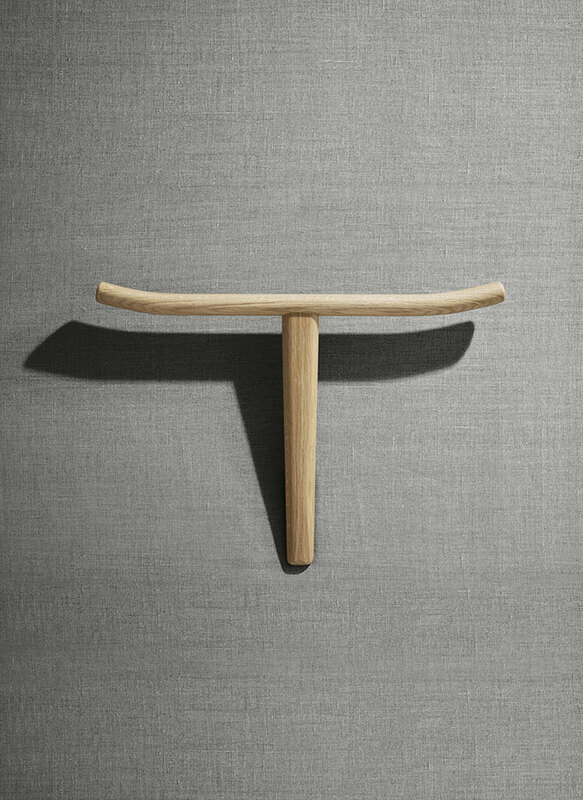 The wooden clothes stand is an archetypal sign traced in the air. It is offered as a wall-mounted or free standing hanger and also as a stool with a high backrest that serves as a valet stand. 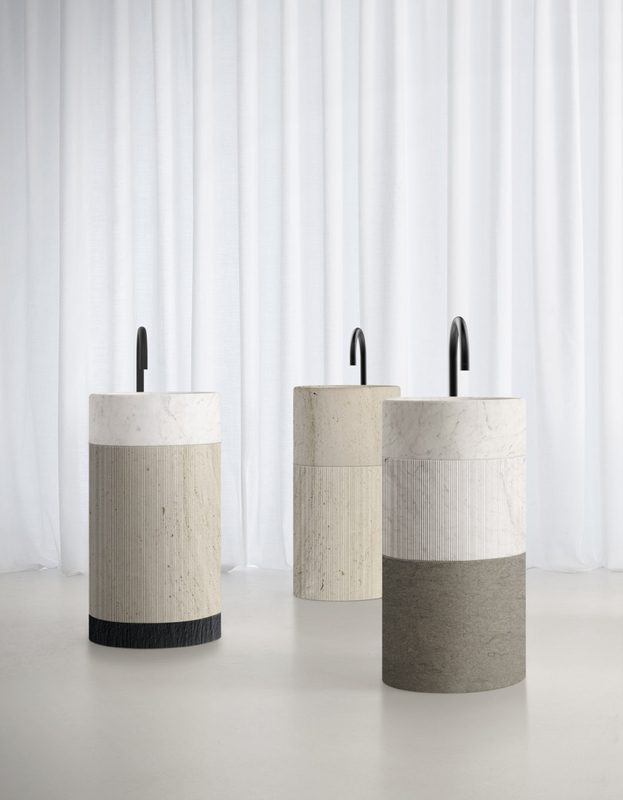 The collection concludes with a series of small stools made from wood and cork - solid geometric shapes which replicate those of the washbasins and bathtub – that can be placed in the room as rocks in a Zen garden. 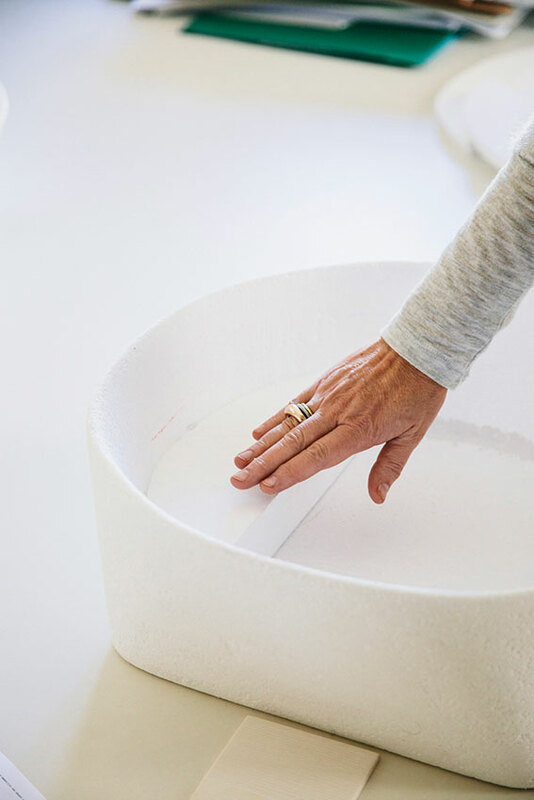 Like a drop of falling water, the sink evolves from a circular top that gradually transitions into a square shape at its base. 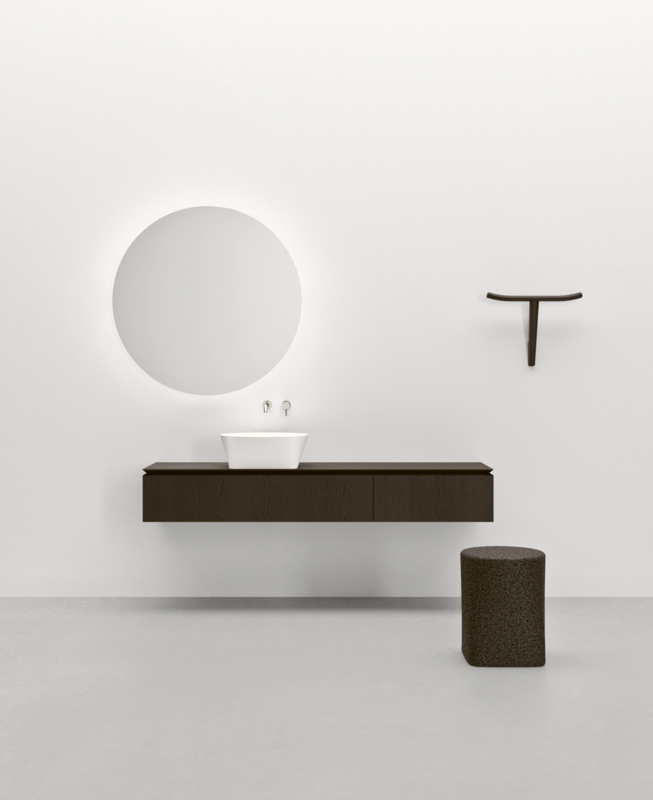 Azuma as a collection that should be able to stand the needs of real life, even in small spaces. 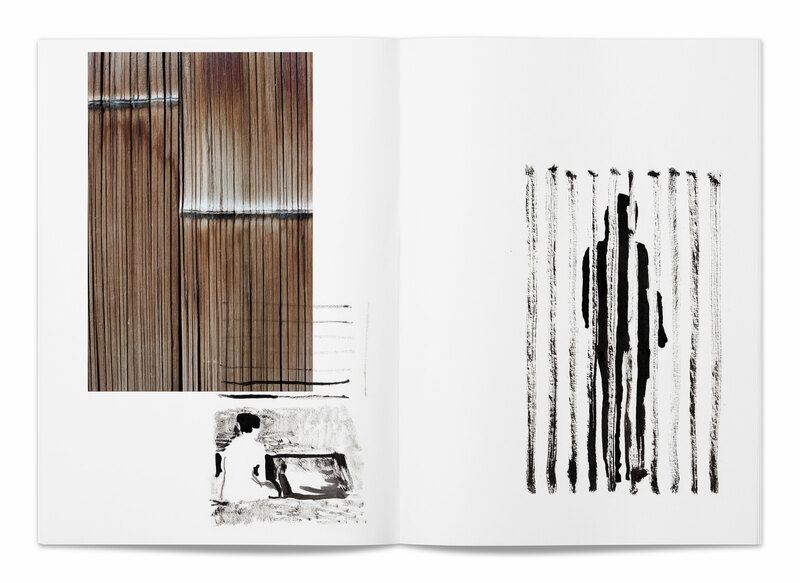 Wooden screens with vertical strips with mirrors allow the light to be modulated with a continuous interplay of shadows, transparency or reflections. 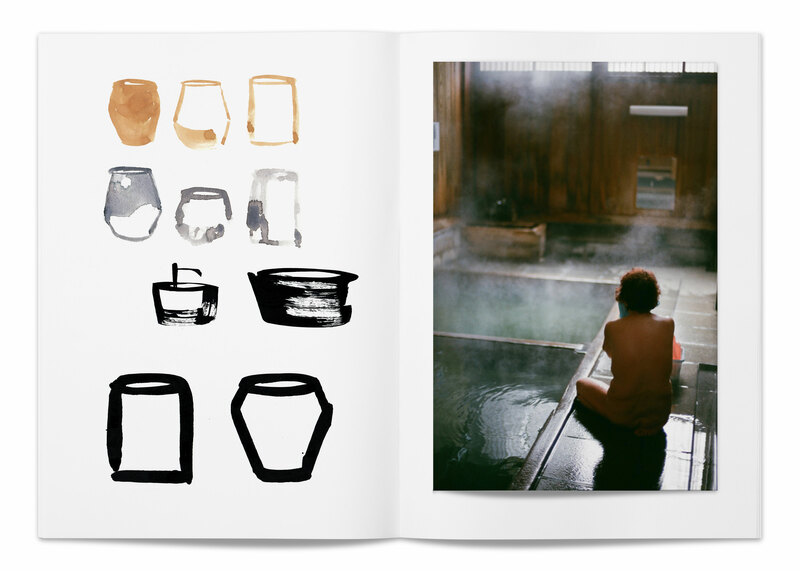 Azuma translates the warm sensibility of the Japanese bath into a contemporary language. 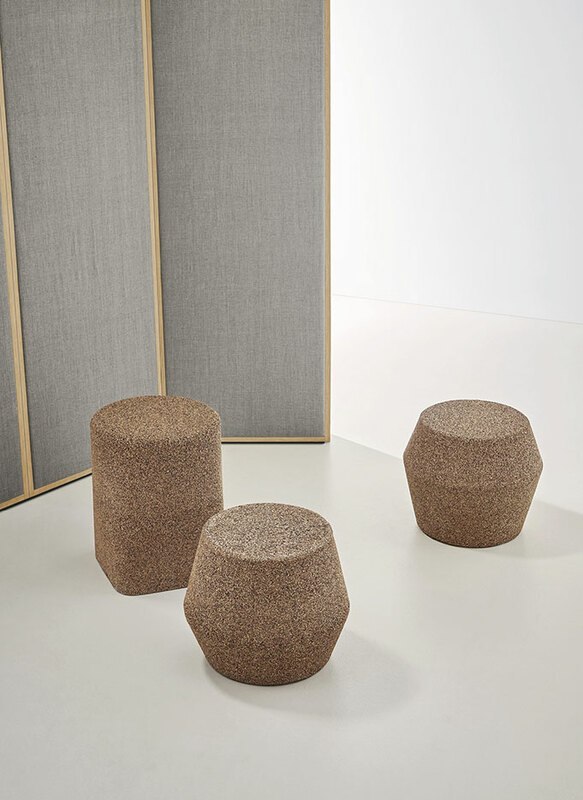 The small stools can be placed in the room as the rocks of the classic Zen garden. 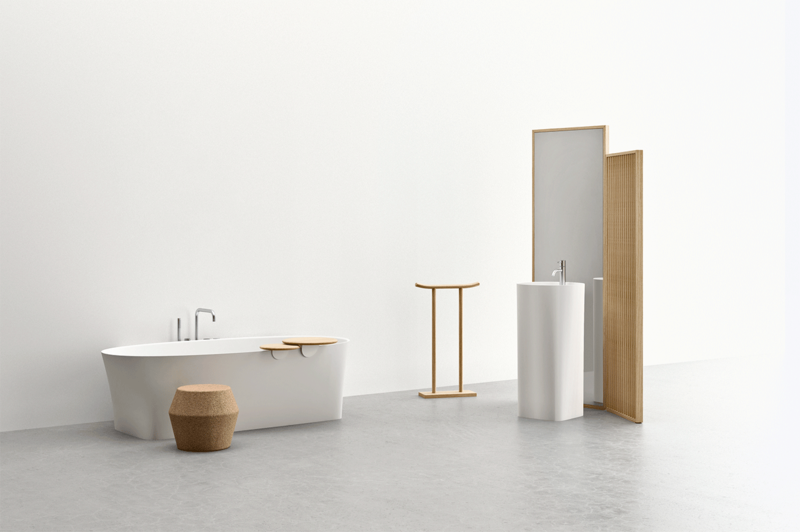 Solid geometric shapes which replicate those of the washbasins and bathtub. 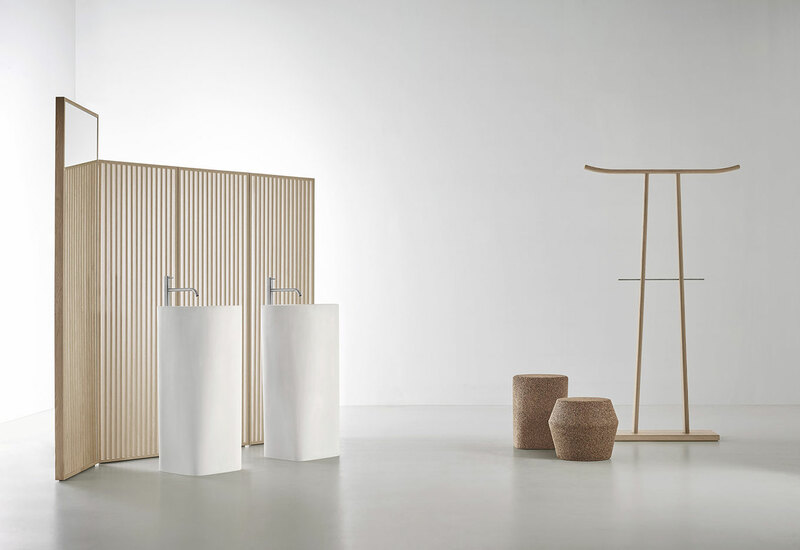 The wooden clothes stand is an archetypal sign traced in the air. It is offered as a wall-mounted or free standing hanger and also as a stool with a high backrest that serves as a valet stand. 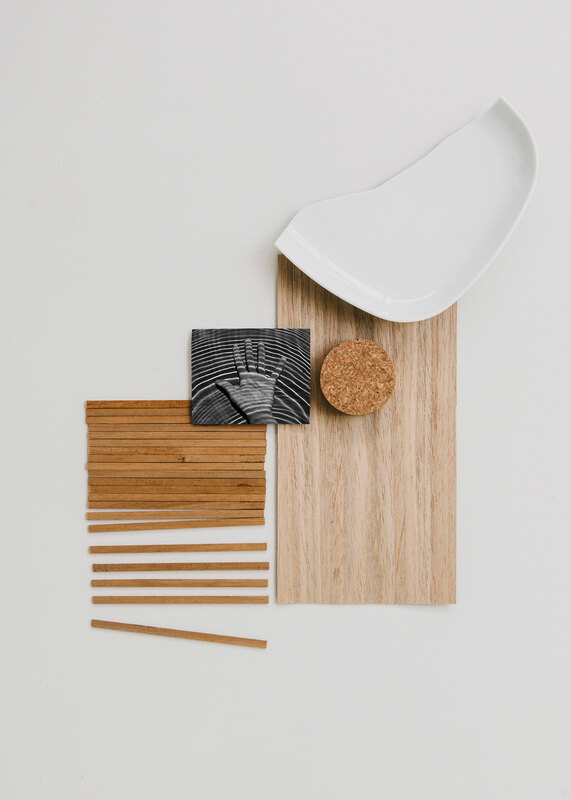 Artificial and natural elements are harmoniously combined. 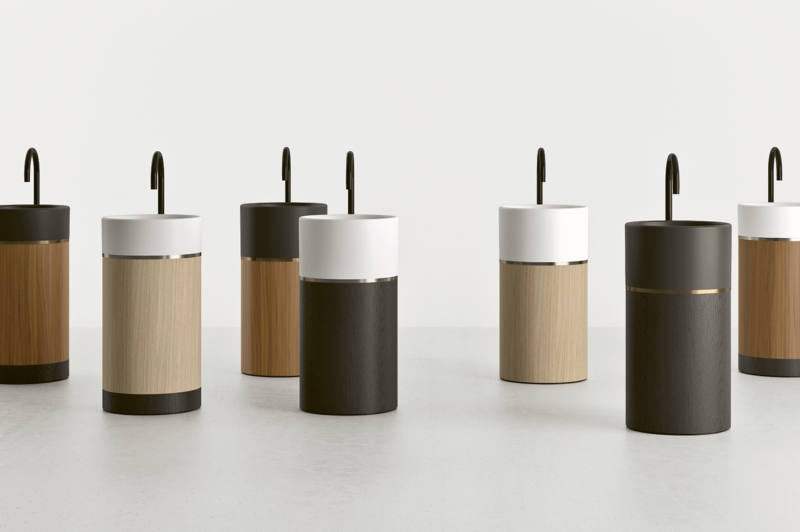 The collection is thought to be a delicate and friendly support in your everyday life. 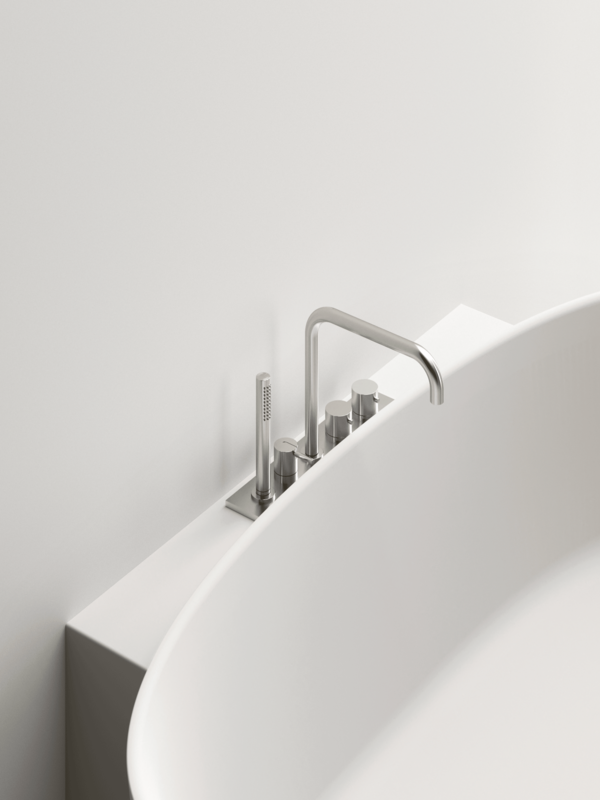 The bathtub that can be fixed against a Wall. 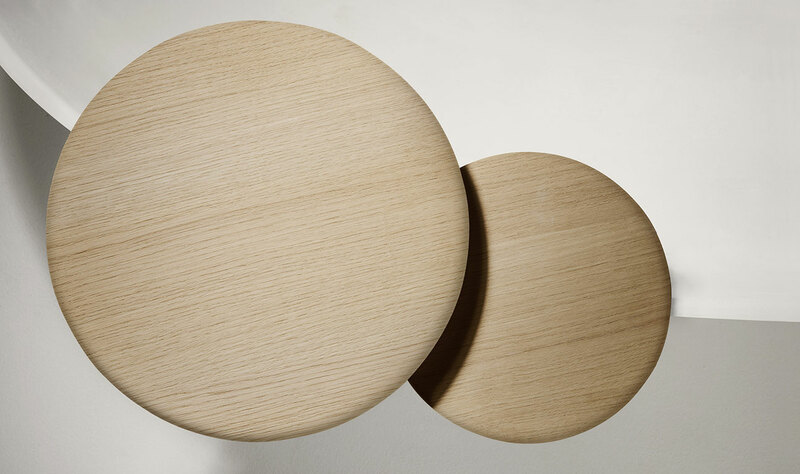 Wooden bathtub trays recall large pebbles smoothed by the flow of water.